Join Emmanuel House International at our Annual “Beacon of Light” Benefit Gala & Auction on Wednesday November 1st at Marco’s Jager Haus 6-9pm beginning with an Octoberfest buffet and auction bidding and ends with post dinner auction winnings amongst dessert. EHI offers confidential and nonjudgmental pre-natal and after-birth support and material assistance at no charge to Moms, Moms-to-Be and their Families who are in crisis due to unplanned pregnancies and live in Putnam County and neighboring Northern Westchester and Eastern Dutchess Counties. At EHI, Clients recieve new and gently-used maternity, baby, toddler, children and adult clothing, as well as emergency baby supplies such as diapers, wipes, and formula. EHI also refers Clients to Donors able to provide baby equipment and furniture as well as to resource providers for assistance with healthcare, counseling, insurance, childcare, transportation, rent, utilities, education, employment, nutrition/food, housing, finances and legal issues. In this way, EHI becomes their “Beacon of Light” so they and their Families can “Get Out of Crisis & On Their Feet”. You too can be a “Beacon of Light” to our Moms and Moms-to-Be, and their Families, by joining us for our annual Gala and Auction, donating an item to the Auction, and/or being a Gala Sponsor. We hope you will join us to celebrate and support our community with dinner, drinks, music, and silent and live auctions. 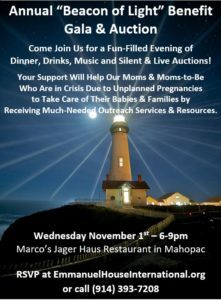 Make your way to Marco’s Jager Haus Wednesday November 1st to enjoy the evening’s entertainment, bid for your favorite auction items, and treat your taste buds. If you are interested in donating an item for the Auction or be coming a sponsor, please email rita@emmanuelhouseinternational.org. You can RSVP for one to eight people with a suggested donation starting at $75 per person or donate at the door. You can also donate if you are unable to attend.